When you wimped out on the high dive, your Uncle Chip told you to man up and pushed you off the board. Sure you felt the sting of the belly flop, but you learned a valuable lesson. Manning up hurts. Don’t let that lesson keep you from facing the work floor with f ... (see full details) (see specifications) #CHP20066. When you wimped out on the high dive, your Uncle Chip told you to man up and pushed you off the board. Sure you felt the sting of the belly flop, but you learned a valuable lesson. Manning up hurts. Don’t let that lesson keep you from facing the work floor with fierce determination. 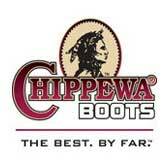 Instead of manning up, boot up in Chippewa Men's 20066 Brown Apache Chocolate American-Made Steel Toe Boots. This Chippewa footwear will help you face the most intense work environments. The sturdy steel toe protection meets ASTM standards, which means the men's boots will protect your feet from rolling and falling objects. In addition these brown boots are also electrical hazard rated, which means they'll deliver protection around highly-charged equipment. The Vibram Stockbridge outsoles are tough enough to bite into the most difficult terrain. This tread design also features oil- and slip-resistance to keep your walk steady and to protect against work floor abrasion. The uppers of the steel toe boots are crafted with smooth, chocolate brown Apache leather, which will give you even more abrasion-resistance. Goodyear leather Welt construction is what holds together the leather uppers to the tough outsoles. This will give you long-lasting coverage. The drill vamp lining delivers breathable interiors for your feet. The 5 Iron Texon insoles provide extra support that cushion the areas of your feet that “flex” the most. This creates a padded barrier between those rough spots on the work floor and the soles of your feet. Fiberglass shanks will give your hard-working feet additional support when you need it most. Made in the USA, the rugged uppers of this men's footwear features an American flag embellishment. Contrast stitching adds even more handsome style. You’re man enough and these leather boots are tough enough. With your pair of Chippewa Men's 20066 Apache Steel Toe USA-Made Boots, you can conquer the work floor, which can be a much scarier place than the public pool high dive. These Chippewa boots are really smart looking, as well as solidly put together. Made in the USA, too, which is always nice and reliable. My issue was that they fit a little narrow for my big wide feet and hurt to wear at first, but wearing them for the first few weeks broke them in and now they're super comfortable. If I was to re-buy them I would go one width wider. I can be on my feet for a long time and not have any pain or cramping in my feet. Highly recommended. I bought these Chippewa 20066 work boots for my husband and he absolutely loves them. He works in a wearhouse and is on his feet all day. I loved the price. This is the second pair of these Chippewa boots I have ordered here and I love them. The lining is amazing in these boots. They are so comfortable and feel like I have sneakers on. I am sure I will be back here to order more. This pair of Chippewa brown steel toe boot 20066 is a great work boot that comes with steel toe protection. Keep in mind that these are not waterproof out of the box, so I recommend applying some Obenauf's LP or Sno-Seal if you plan to get these wet. The leather is durable, and these boots feel comfortable after being broken in which make take a week or two depending on how often you will be wearing them. For sizing, you should size down 0.5 to 1 from your Brannock measurements. Overall, these American-made boots are a great value for under $150. Wow the Chippewa Steel Toe work boot 20066 is good quality and great price. I would recommend this to anyone that's looking for a good work boot. Chippewa Boots: Men's Brown Steel Toe 20066 USA-Made EH Vibram Work Boots is being added to your cart.